Your Nikon D40 or D40X digital camera may be a lot less intimidating after you know how to identify the exterior parts of your camera and get a handle on the automatic and advanced exposure modes. 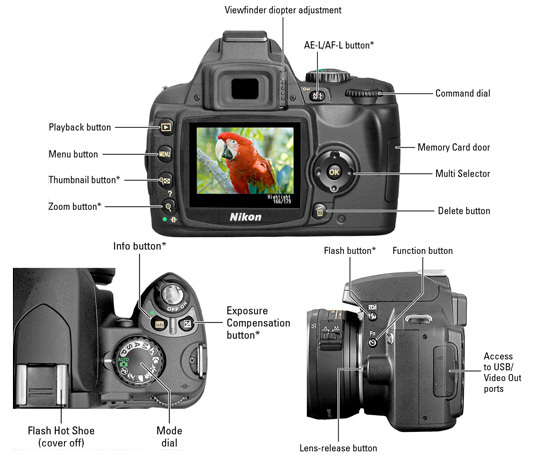 Your Nikon D40 or D40X digital camera has external controls that may look intimidating. This visual guide to the Nikon D40 or D40X camera maps out all those buttons, dials, and other external features located on the back, top, and sides. Controls marked with an asterisk have multiple functions. For optimal images, get a firm grip on the automatic exposure modes for your Nikon D40/D40X digital camera. This overview of the Nikon D40/D40X exposure modes includes Auto and the seven Digital Vari-Program scene modes. 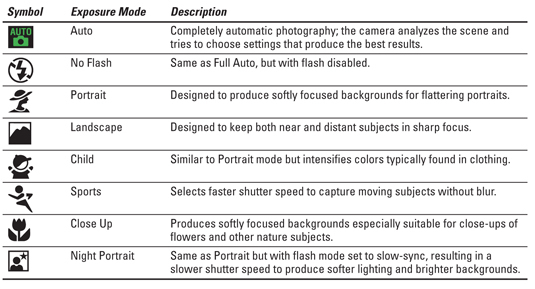 In these modes, you can choose between automatic and manual focusing, but you have little or no control over most other picture-taking settings. You know that your Nikon D40 or D40X is advanced, right? Use the advanced exposure modes on your Nikon D40 or D40X digital camera a couple of ways: Adjust the aperture (f-stop) to manipulate depth of field (the zone of sharp focus); and adjust shutter speed to determine if moving objects appear sharply focused or blurry. You also gain access to picture options not available in Auto or Digital Vari-Program scene modes.